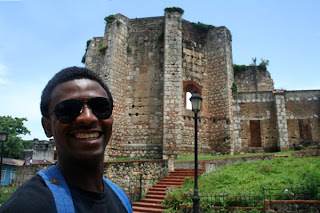 I've been getting used to life in Santo Domingo. I expected it to be hot, and guess what? It is. I must take at least 8 cold showers a day. It helps me to feel better for about five minutes. And then I want another cold shower. Another change is the daily power outages. Usually we lose power from 6-9 p.m. and then again around 3-7 a.m. We try to plan on being out in the evening, often walking along the waterfront or on El Conde, the pedestrian shopping zone. Great for people watching. Otherwise, there's not much to do in a small, hot, dark room with little ventilation. The only window is a screened opening above the door. Somehow, there aren't any flying insects or mosquitos around here. Maybe they couldn't fly far enough to reach the island of Hispaniola. That's lucky because when the power goes out in the middle of the night, I wake up suffocating and open the door. And take another cold shower, of course. We've been playing racquetball every evening for at least two hours at the Olympic Sports complex. Santo Domingo has one of the best racquetball clubs I've ever seen. Eight glass-wall courts, two exhibition courts with stadium seating. The club was built for the Pan American Games just about 8 years ago. They have lot of great players and a strong Juniors program, too. We get to the racquetball courts by communal taxi, usually about 20 minutes depending on traffic. The taxi costs 12 pesos each (about 35 cents US). Maximum capacity is 7 passengers, two up front with the driver and four in the back seat. Depending on the size of the butts, you get pretty upclose and personal with total strangers. On the way home, for some reason, we usually have to take two taxis. Andre and his cousin Patricio are members of a nice gym, walking distance from here. I've been working out with them 3x a week. I used to think I hated gyms, but I really enjoy the work-out. Andre's neighbor is a stay-at-home housewife and mother. She and Andre work a deal where she cooks for him. It's great because her cooking is fresher, tastier and healthier (less salt and oil) than what you find on the streets. Andre's studio doesn't really have a kitchen, just a small propane camping-style stove, no sink, a small fridge. So we're not really set up for cooking here. What Miguelina makes is enough for lunch and dinner. 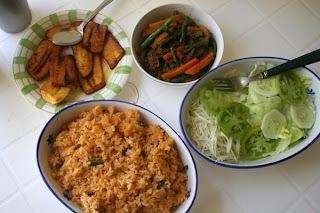 A typical meal has rice, some kind of meat dish (Andre loves meat, so I let him eat that), a salad, and fried bananas. She often makes zapote or mango smoothies or passion fruit drinks too. Tomorrow we take off for an all-inclusive resort in Punta Cana, about 3 hours from here. Some friends are staying there and invited us to join them. Usually I don't like fancy resorts, but it will be a nice respite from the heat. I'm looking forward to AC, a pool, and a beach. We're just going to stay 3 nights, then come back to Santo Domingo for a few days, then off to Haiti.